Abraham Benjamin de Villiers (born 17-Feb-1984; Warmbad, Transvaal Province) is a right-handed batsman and an occasionally wicket keeper, who plays international cricket for South Africa. He made his International debut in Test against England on 17 December 2004 at St. George's Park. On 23 May 2018, he socked everyone via a sudden announcement retired from international cricket. 26-Aug-2015: AB de Villiers breaks Sourav Ganguly's world record of being the fastest to score 8000 ODI runs, he took 182 innings. 18-Jan-2015: AB de Villiers struck the fastest century in ODI cricket, taking 31 balls to pass the milestone against the West Indies at The Wanderers. He also hits fastest half century, taking 16 balls. 14-Nov-14: AB de Villiers became the fastest to reach 7000 One-day International run mark, bettering Indian Sourav Gaunguly record during his 80-run knock in SA's third ODI against Australia in Perth. 20-Feb-2014: AB de Villiers has become the first player in the history of Test cricket to make a half-century in 12 consecutive Tests after he passed 50 in the first innings of the opening day of second Test against Australia at St George's Park on Thursday. 04-Feb-2013: Part-time wicket-keeper AB de Villiers became the first player in Test history to make a century and claim ten or more dismissals in a match after hitting an unbeaten 103 in the second innings. He achieved the feat in the first Test against Pakistan at the Wanderers. 21-Nov-2010: AB de Villiers' unbeaten 278 against Pakistan in the second Test at Abu Dhabi is the highest Test score by a South African batsman. 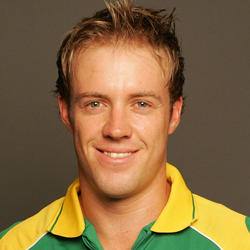 27-Feb-2010: AB de Villiers (102 not out off 59 balls) slammed the seventh fastest century ever in the history of one-day internationals during the third ODI against India in Ahmedabad.